Not far from the launch site of this past weekend’s B.A.S.S. Elite Series event on the St. Johns River near Palatka, Fla., is where explorer and conquistador Juan Ponce de Leon searched to find the fountain of youth. While looking for gold and riches, he also believed from his discussions with natives there was a fountain that would restore youth to anyone. One of the most humble and cerebral anglers on tour, Rick Clunn doesn’t like the term “legendary” and may be a bit embarrassed by it. 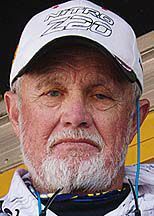 His resume and his feats on the water fishing professionally certainly rank high and his victories have spanned generations and decades. His 32 Classic appearances, 16 wins, four in the Classic and more than $2.5 million in career winnings are legendary in my book. In 2016, he became the oldest angler to win a Bassmaster Elite tournament with a win on this same St. Johns River. Two years later he did it again and his story is much more than about age. It’s about drive and perseverance. Fishing may be the only sport that doesn’t recognize age or gender. Many years ago, he said, “There are no limits” and I have an autograph from him in my office that says that very thing. More than once it has inspired me and given me a jump start when I had questions about my ability and age. It has done that very thing for others who thought about being too old to compete. I had the opportunity a few years ago to be on ESPN’s Greatest Angler Debate TV series and you guessed it … Clunn was the winner. Thirty-five anglers started and by a vote of the fans he won out. That also puts him in “legendary” status with me. Two years ago, he said, “Never accept that all of your best accomplishments are in your past,” and by golly, proving he meant it, he did it again. Age is just a number and Clunn again proved it didn’t matter much against some of the best young anglers in the world. His drive and determination, knowledge of how fish set up before and during the spawn and some old-school lure choices were enough to put him on top. Some of today’s NEW pros approach their game with power and being loud. Over the top seems to gather eyeballs, but Clunn has not signed up for that school. He does things the right way with confidence, a cerebral approach and concentration. I saw that with another longtime pro in the same tournament in Mark Menendez of Kentucky. There was genuine excitement, relishing the moment and a class that is from an era that may be leaving. I hope not. No yelling and screaming, no swearing or exaggerated antics, just fishing and as a guy who has been around for a long time too, it was refreshing. “Dadgummit, holy moly, good gosh, good gravy” and a fist pump was enough for me to show excitement and it was genuine. Refreshing indeed. Clunn goes about his business with a methodical, quiet approach, hat pulled down with sunglasses near the end of his nose, and when watching him fish you can almost hear the gears spinning inside his head. Knowing when to switch from a spinnerbait to an old school Ditto Gator Tail worm and back again was a difference maker. Getting up that last morning he knew that wind was going to be a key factor and he proceeded to utilize that tool for all but one fish in his last-day catch of over 34 pounds. Only one fish was caught in the worm that day and it happened right after it had missed his spinnerbait. Fishing at the highest level does take stamina and Rick Clunn gets his training by walking the Ozark Mountains, eating right and stretching. He also finds the time to coach his son’s high school fishing team that we have spoken about on several occasions. Maybe, just maybe, guys like Clunn and Menendez have a place in the new generation of anglers. B.A.S.S. should be proud of this new product, too, and rest assured they are not going away very soon. The crowds in Palatka were huge, wanting to see how this new crop of Elite pros would fare on their river. My guess is they were pleased, too. Terry Brown is President of Wired2Fish.com, an industry leading, daily website and social media fishing centered community that provides information on products, industry newsmakers and fishing techniques. You can read more by going to www.Wired2Fish.com. Another COMPLETELY WORTHLESS column by Terry Brown. Recreational fishing is immensely popular but only a minuscule percent of recreational fishermen pay any attention to tournament fishing. Most don't have the disposable income for new boats, especially not the high end ones. Most are stuck with the vehicle they already have and can't afford to buy a new truck specially designed for towing. So that makes about Five columns in a row completely irrelevant to the average reader and recreational fisherman. I wonder if Mr. Brown has noticed that this winter's record cold has produced a record long ice fishing season. If so, he hasn't mentioned a word about it. He could easily do a fresh RELEVANT ice fishing column every week. Where's the hot bite, reservoir techniques, pond techniques, baits, early season tactics, mid season tactics, late season tactics, ice out tactics, warm water discharge locations and tactics, spillway tactics. Potential topics abound and yet we still get column after column that only a very few can relate to. One more reason not to renew Pantagraph subscription.